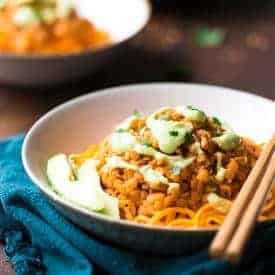 This peanut noodle vegan pasta bake is made with tofu noodles, fresh veggies and a Thai peanut curry sauce for an easy, meatless, weeknight-friendly meal that is under 200 calories! Hold on a sec’ there. I’m not quite ready to pry my face from its current state of being planted inside this skillet of super velvety-smooth, saucy and perfectly spicy-sweet peanut noodles. Peanut noodles that are mixed with, ummm, ALL the crisp-n-crunchy fresh vegetables that I could fit into my shopping cart. Seriously though, do you SEE the rainbow colored deliciousness on your screen? LIKE WHOA. If my eyeballs could smile, they would be because, like, PRETTY FOOD YES PLEASE ALL THE TIME. That is what I don’t want to get my face out of. But, for you, I will stop munchin’ and get to talkin’. But only for however long it takes me type approximately 500 words. 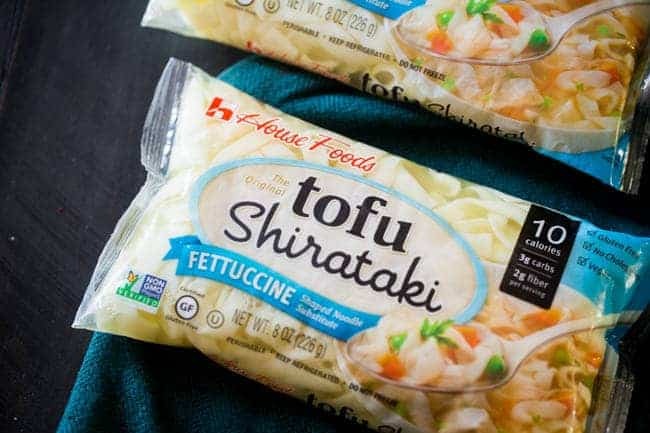 And I might take a few breaks to go back into the refrigerator and slurp down a few tender, soft House Foods Tofu Fettuccine Noodles that are coated in the creamiest, lightly spicy sauce that makes my peanut-butter-loving-taste-buds wiggle all the way down to my toes. This isn’t the first tofu noodle rodeo here on FFF. You know I love them. You’ve seen the recipes and the countless Instagram posts about my most favorite stir fry lunch EVER. I mean how can you not love noodles that fill your every comforting-carb-needing ways for only 10 CALORIES a serving?! You can’t. End of story. So. 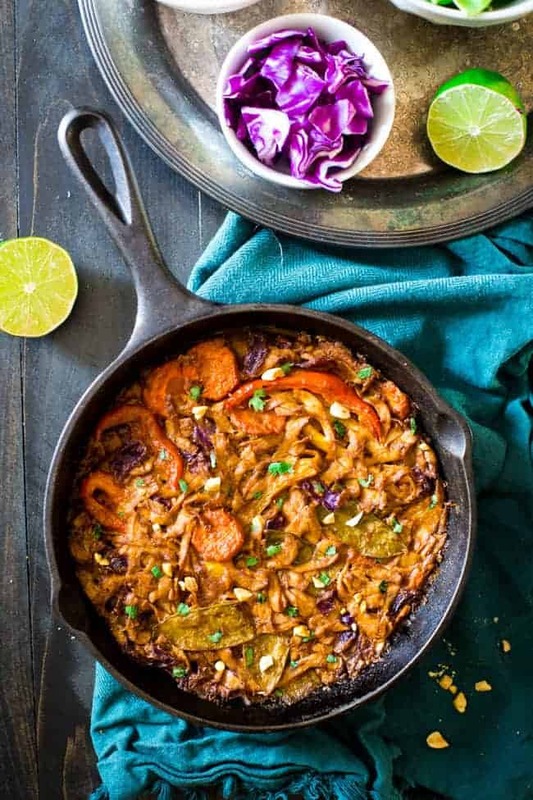 This skillet full of luscious peanut noodles and crunchy-fresh vegetable tastiness. You’re going to want to shove into your face this meatless Monday. Which just so happens to be tonight. COINCIDENCE? I THINK NOT. I was actually going to tell you about how the Huberoni and I tag teamed this meal like the yummy-food-making duo that we are (except he is just usually the “taste tester” part of the duo, not the creator) but then I started re-eating the tangles of creamy, soft noodles in my head, and I got a little sidetracked. Sorry. Like I said. We tag-teamed this. I added a little of this, a little of that and then we tasted. HMMMM maybe more lime? OKAY LET’S TRY IT. OH YES, there it is. That is PERFECT, how about we just skip the baking and go fork to face RIGHT NOW? Except don’t skip the baking thing. Because, it makes the noodles EVEN better. Which is actually a real thing. I didn’t even think that they could get more YUM, but they DID. Doing a little oven time helps get the sauce to thicken up, and really ENHANCE that sweet and spicy peanut-y flavor. Plus the veggies get all sorts of tender crisp in a way that made Mr. FFF NOT LEAVE ME ANY LEFTOVERS. Like, he went to work. 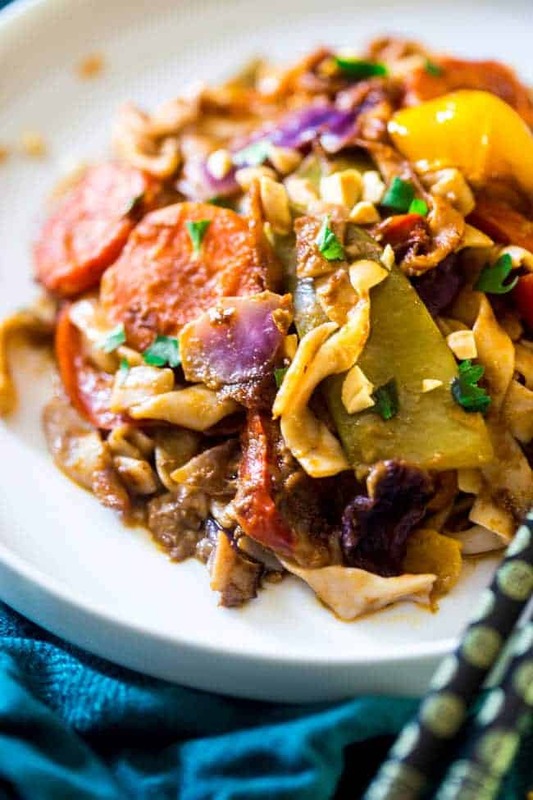 I went to eat dinner when he left, with visions of crunchy, colorful veggies swirled together with saucy, coconut deliciousness dancing around in my head. AND the pasta bake? NO WHERE TO BE FOUND. I can’t confirm or deny that I sent a few HAGRY text messages after that discovery. <—Hint: I DID. Heat the peanut oil on medium/high heat in a medium cast iron skillet. Add in the garlic and ginger and cook, stirring constantly and until golden brown and fragrant, about 30 seconds. Add in the sliced carrot and cook until lightly brown and they begin to soften, about 3-4 minutes. Add in the peppers, peas and cabbage and cook for two minutes. Add in the Tofu Shirataki Noodles and cook for an additional two minutes until lightly browned. 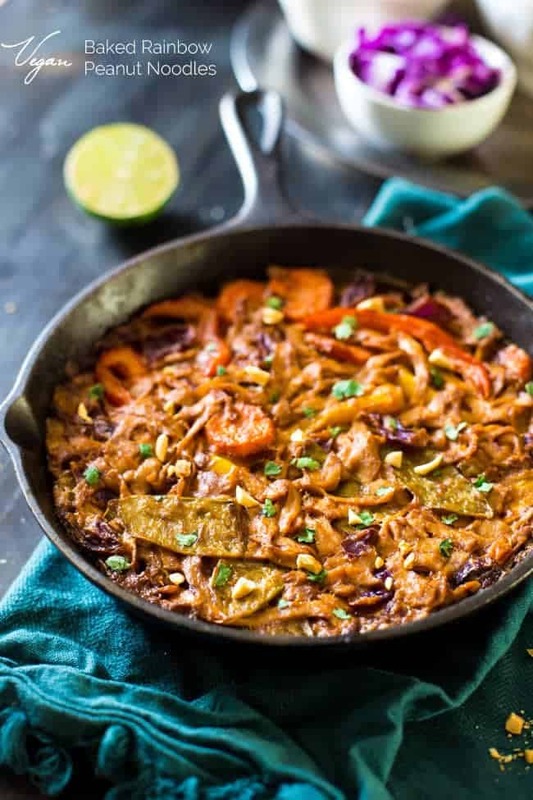 Add the peanut butter, coconut milk, soy sauce, curry paste, coconut sugar and lime juice into the pan and stir until the peanut butter melts and the everything is well mixed. Bring the mixture to a boil, and cook for 3 minutes. Then, reduce the heat to medium and simmer, stirring occasionally, until the sauce thickens, and reduces by about half, about 7-8 minutes. Pat the noodles down with a spatula so that the mixture is very flat and condensed and place the skillet into the oven. Bake until the top is golden brown and the sauce is bubbly, about 30-35 minutes. THIS POST IS SPONSORED BY HOUSE FOODS. THANK YOU FOR ALLOWING ME TO CONTINUE CREATING GREAT CONTENT FOR YOU BY SUPPORTING PARTNERSHIPS WITH SUPER-FAB BRANDS THAT FOOD FAITH FITNESS LOVES TO WORK WITH! AS ALWAYS, OPINIONS REMAIN 100% MY OWN. What a gorgeous pasta bake, Taylor! I love the colors in this dish! And of course, the flavors too…I think I would definitely face-plant into this bowl of deliciousness! I’ve never made a “bake” with tofu before, but THIS. This looks amazing. Turning tofu skeptics into tofu lovers with this recipe for sure. Thanks Erin! The noodles totally turned me into a tofu lover! This looks so good and healthy – I love it!!! My boys would love this. Bookmarked! 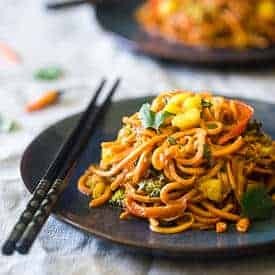 I’ve always been on the fence about those tofu noodles, but you gave me hope with this recipe. I’m gonna give it a go asap! You should try them. I was too, and now I eat them very regularly!Thanks Mike! 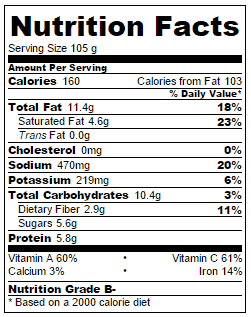 Ok, I haven’t tried these tofu noodles but I can see that I need to get on that STAT! Because colorful skillet is just calling my name! You would LOVE them Alice! Thanks! What a gorgeous dish! I love the spicy peanut sauce and all that fresh veg. Definitely need to check out those tofu noodles too! YES you do, they are BOMB!!! Thank you Mary, I hope you try the noodles! 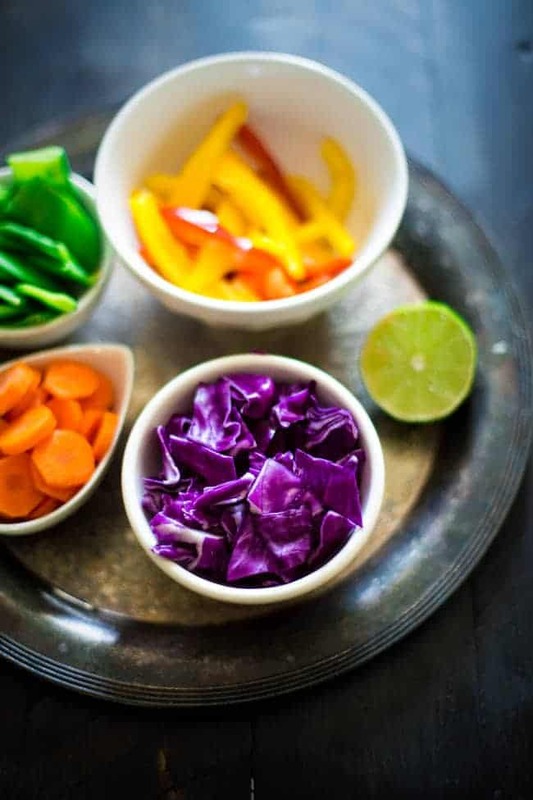 wow these look beautiful, I love all the veggies and the colors, great flavor! What a delicious and colorful meal Taylor! Love it! YOU NEED TO GET THEM! Seriously, I am eating them for dinner tonight, SO GOOD! Thank you Brittany!! Yay color! I live in a pretty rural area, so I’ve never run in to tofu noodles before, but I’ll have to get them online. They look great! I love anything that has “peanut” and “noodles” in the same sentence. :). Looks lovely! They are SO good! You definitely need to try them Amanda, I’m an addict! Thank you! pinned! I need this in my life like right now! this look SO good! 😉 plus love that you baked this too, thats a really great idea! 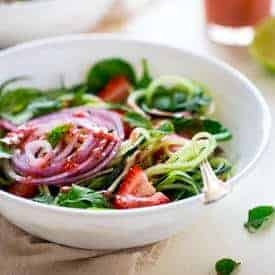 I love everything you make with shirataki noodles!!! Oooh, I’m totally going to try these noodles!! I bet they have good protein too! Yes! And they are so tasty lady! Thank you! If I were in your position, I’d keep my face right where it was, nice and cozy in that there skillet. Love the sauce! I knew I liked you for a reason. Thanks Jennie! This looks so darn good, Taylor! That purple cabbage is just stunning. I can’t wait to try these noodles. Thank you Jamie, I hope you love them as much as me! This looks delicious and all those colors!!! Awesome skillet dish Taylor! 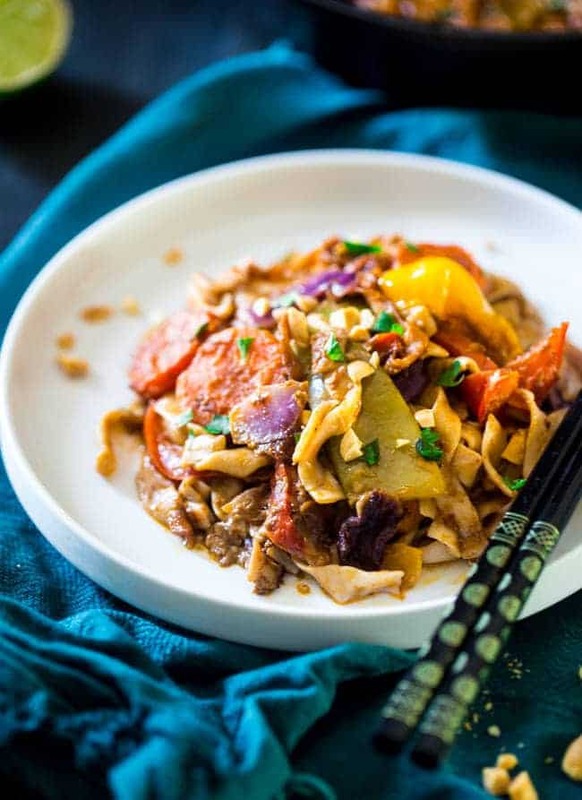 Just something about that cast iron skillet….understandably no leftovers in sight….now I’m wanting to try these amazing tofu noodles! Yes! Anything in skillets mean no left overs! Thanks Allie – you’d love them! Um. Are you kidding me? This looks amazing! Faceplant for sure! Yesss please! 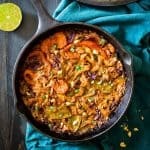 Easy skillet meals are a must with school starting. Looks incredible. Right! It’s all about the easiness! Thanks Laura! Making my peanut noodles for dinner tonight! Never would have thought to do it as a bake, but maybe now I will! DO IT! It’s so yummy!!! Thanks jessica! They are really tasty Liz! Thank you! Thanks for all the lovin’ Savita! I hope your day is great! This looks gorgeous, girl! I love those shirataki noodles but have never tried baking them. I am totally smitten and can’t wait to try that next time! You totally need to bake them, so tasty!! I love the noodles so much too! Thanks Kelly!